During a non-typical Monday-night trip in March, I headed off to film a new hotel feature segment for my new TV show, Great Escapes, where I visited a city within a city. 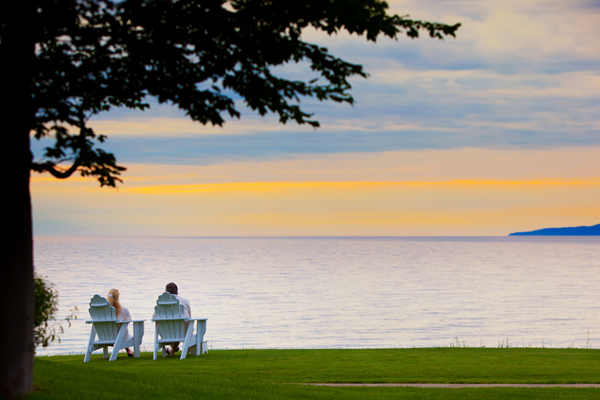 A residential and resort community located on the shores of Lake Michigan, Bay Harbor is the epitome of Northern Michigan lakeside-side luxury retreat. 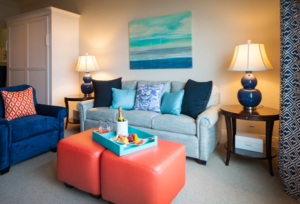 The development stretches along five miles of shoreline and includes an equestrian, yacht, and golf club as well as being scattered with retail shops, restaurants, private condos and homes, and my destination, the Inn at Bay Harbor. Nestled on the shores of Little Traverse Bay, the Inn has 123 guest rooms, including 84 suites, 22 two- and three-bedroom Lakeside Cottages, and 13 Crooked Tree Cottages. 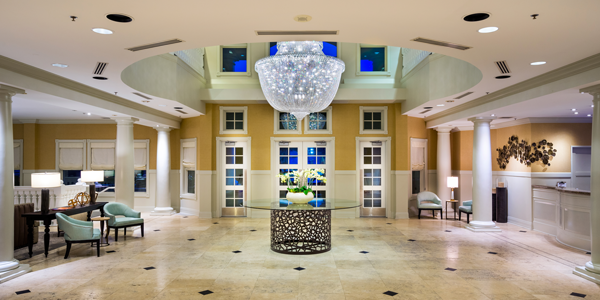 In June of 2016, the Inn became the second Autograph Collection Hotel in Michigan and joins Marriott International’s distinctive portfolio of independent hotels recognized for celebrating individuality. After a half-day of filming, it was time to relax and enjoy the near empty hotel. Being a seasonal destination, Northern Michigan experiences dramatic fluctuations in occupancy in the winter season, of which we were catching the tail end of. The snow has melted but winter has yet to release her grip and provide the residents of this quaint northern Michigan town a much-needed dose of Vitamin D. The views overlooking the bay, while always beautiful, lack the same ability to slow the heart and completely remove anxiety in March as a sunset can in late August. All year, guests can explore a range of culinary options including the Vintage Chophouse & Wine Bar, a classic all-American steakhouse and cocktail lounge offering the finest in upscale dining. 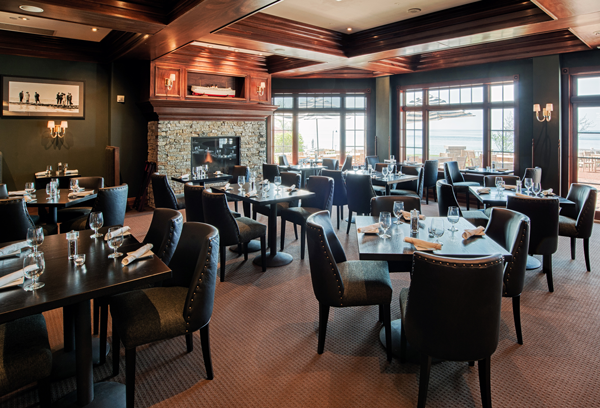 The Sagamore Room serves you breakfast daily and offers the best views overlooking the Little Traverse Bay with indoor and outdoor seating. Following that, stop by the Inn Cafe for a light snack to enjoy on your room’s private balcony or in the summer time, order from the poolside Cabana Bar for a tropical cocktail while you take a quick swim. For those looking for a bit of high-society, be sure to experience the traditional British-style Afternoon Tea, served daily in the main lobby. Finally, those looking for a real escape, The Spa has been recognized among the “Top 100 Resort Spas in the US” by Conde Nast Traveler. Currently, they are planning a total renovation of the spa which I’m sure should make it even more relaxing and serene. The best part of the trip was, of course, the food. We, my crew and their wives and I, were invited to dinner at the Vintage Chophouse. If you know me at all, you’ll know that my passion for the culinary arts and the way food shapes different cultures borders on the extreme. The excitement I have for an upcoming meal is something akin to how my I imagine my girlfriend’s 4-year-old nephew feels when someone mutters the words ice cream. It can and many times does, completely remove the other thoughts bouncing around my ADHD-laden mind and takes me back to being a child. I’m many times asked what was the favorite place I’ve ever lived or traveled to and my brain immediately flicks through millions of memorable moments, which for me, many times are centered around food. I have an appreciation for almost all food and ingredients, but very few can match the intensity in which I look forward to enjoying a perfectly cooked steak. Whether it’s a petite 4 oz filet mignon or a mammoth tomahawk ribeye that could easily feed a small family, steak can, if in the right hand’s become something that books are written about or should be at least. Hearing that the hotel had a steakhouse and we planned to dine there for dinner, my mind thought of little else throughout the entire day. Upon arriving, we belly up to the bar. Naturally, a slew of hand-crafted cocktails was had and multiple selections from the wine list were poured before we sat down to enjoy what was at least by me, a much-anticipated dining experience. I had looked at the menu earlier in the day and had decided on my main course well before I reviewed the menu once we sat down. One of my favorite experiences is dining in a group, which allows you to order many different appetizers and have the opportunity to try them all. We ordered the Charcuterie Board, Baked Goat Cheese, and Mussels, all of which did not disappoint. The charcuterie and cheese board was delightfully varied offering generous portions and each selection complimented each other perfectly. The mussels were fragrant and the Vermouth-shallot crème that they were cooked in would have made an old shoe taste fantastic. Finally, my cowboy ribeye arrived and with the anticipation of a kid on Christmas morning finally opening his first present, I cut into my steak to find a perfectly prepared cut of meat that made all my worries fade away. From then on, you could have told me that my leg was on fire and I would have calmly extinguished it with my table water and continued to enjoy my steak. I normally aim to eat a well-balanced diet which includes plenty of green vegetables, but when I make the decision to get a steak, which isn’t too often, I aim for the best one that the menu has to offer. 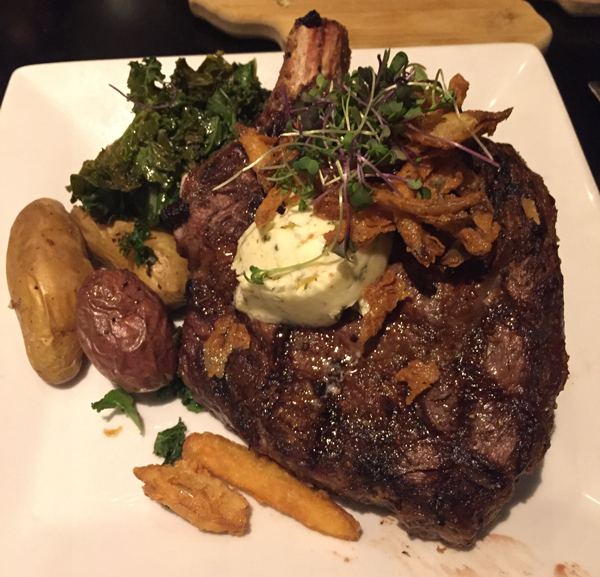 The cowboy ribeye from the Vintage Chophouse delivered on my expectation and I left happy and looking forward to my next visit. Are you planning a vacation and not sure where to visit? 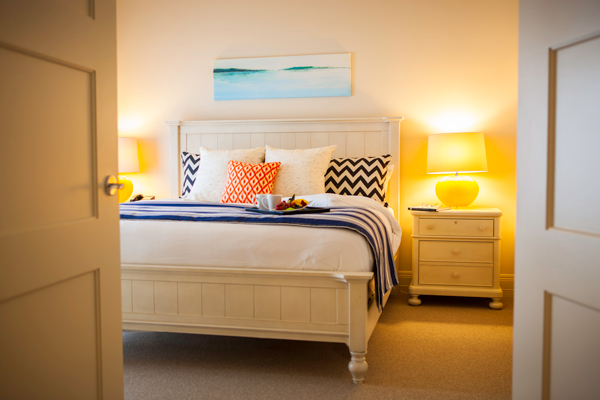 Here are my travel expert recommendations if you’re looking to visit the Inn at Bay Harbor. Book between June and mid-September so you can truly experience a Northern Michigan summer. 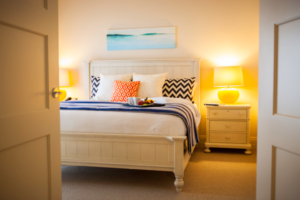 If you’re staying for more than two nights, book one of the suites as they all have a kitchenette or full kitchen and dining options on property are great but limited. Bring a few bottles of wine and/or your favorite spirits so you can enjoy a cocktail on your balcony instead of always going downstairs. 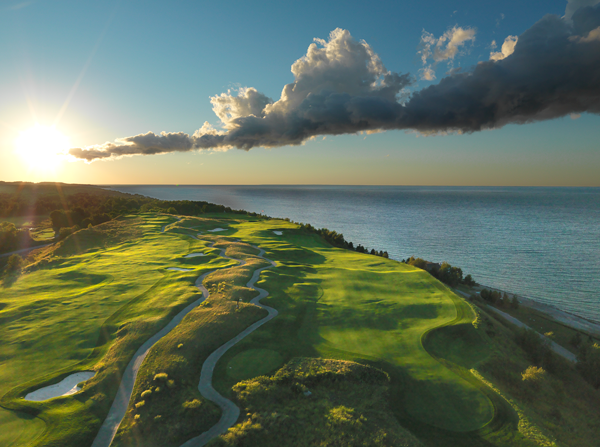 Bring your golf clubs as there are three amazing courses at Bay Harbor with truly unforgettable views over Lake Michigan.